The doctor seemed fine but the young women behind the check in desk did not know what they were doing. Mydaughter was the patient and she told me they almost x-rayed the wrong knee. She had to tell the tech at least twice which knee it was. The doctor seemed fine but the young women behind the check in desk did not know what they were doing. My daughter was the patient and she told me they almostx-rayed the wrong knee. She had to tell the tech at least twice which knee it was. Everyone is always friendly and polite. Staff is caring and professional.. Dr THOMPSON is the best!! 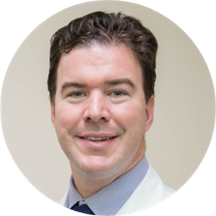 Matthew M. Thompson, MD is a board-certified orthopedic surgeon specializing in sports medicine, knee and shoulder surgery, as well as general orthopedics and fracture care. He has served as an Assistant Team Physician for the New York Mets baseball team and provided team coverage for the Los Angeles Dodgers, as well as several high school football teams. He has taught courses in sports medicine and shoulder surgery to other surgeons both locally and nationally. He completed Fellowship training in Sports Medicine and Shoulder Surgery at the top-ranked Hospital for Special Surgery in New York City. At the University of Kansas, he graduated with honors in Chemical Engineering and participated on the Track & Field team. He completed medical school at the University of Pennsylvania School of Medicine, and then completed his orthopedic surgery residency at George Washington University in Washington, DC. In addition to treating sports injuries and general orthopedic issues in patients of all ages, he specializes in shoulder replacement and complex injuries of the shoulder, elbow and knee. His research interests and publications include anterior cruciate ligament (ACL) injuries in young athletes, shoulder dislocations, hip biomechanics and athletic injuries, and baseball-specific orthopedic injuries. Dr. Thompson has also received Subspecialty Certification in Orthopedic Sports Medicine by the American Board of Orthopedics Surgery. Excellent bedside manner. Thorough, empathetic, and provided excellent explanation. Dr. Thompson was very attentive, knowledgeable, and personable. He put my mind at ease, and I am very pleased with the recommendations he made for me. Dr. Thompson was very pleasant and had a plan to utilize progressive treatment (least invasive- see what happens and then increase treatment if necessary). I prefer this method so it was a good visit for me. Dr THOMPSON is an excellent Dr w/great bedside manner. He is very down to earth. The front desk staff is very helpful and polite especially Oneida. Very professional and friendly, I felt very welcomed and I look forward to coming back. I broke both bones in my leg, just above the ankle. Dr. Thompson did my surgery. I had to have a plate & 6 screws put in. The only pain that I had was some discomfort from the staples that closedthe incision. I've since had the staples removed, and am well on my way to recovery. Great doctor. Really nice guy. Great staff. Nice clean office in a great location. Takes Obama-care. Awesome! Very good doctor, reception personnel was not professional. Dr. Thompson was very knowledgeable about my knee issue and provided options for immediate treatment and long term treatment. I recommend his practice! I'm aware that you cannot expect to be in an out from a Doctor's office, is ridiculous though that if your appointment is at 3:30 and you don't get to see the Doctor until almost 5:00 because he's overbooked trying tojump from one patient to the next! I call it greediness. Dr. Thompson was great and the entire staff was very friendly and helpful. Dr. Thompson was excellent. Great bedside manner and I felt confident in his treatment approach. Great service from the time in the door until out. Electronic check-in was convenient and staff at front desk were courteous and quick. Bedside manner was excellent, from the Xray technician to the Doctor. Both east going and easy to talkto. Doctor always smiling. Answered all my questions and gave clear directions and consultation. Highly recommended. Dr. Thompson is very knowledgeable, but he seems very rushed. The office is not very organized and the wait is awful! If I had the opportunity to go somewhere else for my broken ankle I would. For this to be anorthopedic office, there is not much seating and the staff is not very sympathetic to the disabilities of the patients due to this. The waiting room does not have enough chairs, and often people are standing without seats since the wait is so long. Great Dr!! Staff was pleasant and friendly. Would definitely recommend this Dr.
At Last! A doctor who believes me and has actually treated what I have! I am so grateful and thankful! Maybe finally I can get some relief! Friendly and professional staff. Short wait time and really liked the Doctor. I thought the doctor was very nice but the front desk staff were all unprofessional and rude. Honestly, Dr. Thomas and the X Ray technician were great. The front desk team was terrible. They were all in a terribly sour mood and when you come to an Orthopedic doctor's office, most folks are in a lot of painand probably pretty grumpy. Courteousness and smiling goes a LONG way to make people feel better. I had to tell them that I had a co-pay, they had no idea. Front desk team 0 out of 10. Doctor and med team - 8-10. I deducted a couple of points because I had to wait to 2 hours past my appointment time. The Dr. was great! I only had an issue with the professionalism of the front desk crew, 3 out of 4 of them seem like they didn't want to be there. The doctor was great. The front desk staff attempted to charge me for a outstanding co pay for a day I never came. Eventually got it all straightening out but the staff was not pleasant about giving a receipt for myvisit. Not a big deal just a little aggitating. He was nice And very helpful!! The wait time was a little long due to numerous new patients who of course had to do all of the registration paperwork. Highly recommended.